Totally true, if your video card has the jam. For some people with 2009-2012 Mac Pros, there’s a limit to what video cards are compatible with those platforms. In most cases, CPU processing was the best option. Now, if that option is taken away from those people, me included, then further AI Gigapixel upgrades are non-starters. Give us back the option! Why would Topaz remove the option anyway? Was the code bad, or in the way, or what? Doesn’t make sense to remove functionality for no good reason! Why would Topaz remove the option anyway? I’m not sure they have removed the option, have you checked with support? It may be that it automatically switches if the GPU isn’t suitable … E.g. OpenCL is a lesser version. CPU support has not been removed - it’s now in the help menu. I tested the image 4000x3000, enlargement 6x at 24000x16000. Process time 2 minutes 43 seconds. I think it may be more demanding for a GPU. I have the Radeon R9 390 graphics. Why don’t the geniuses at Topaz do something simple like present the people who pay good money for plugins, a product that works for a change. All their products work absolutely fine for me, and many, many other people too. Have you checked to see whether your machine specs match the Topaz requirements? 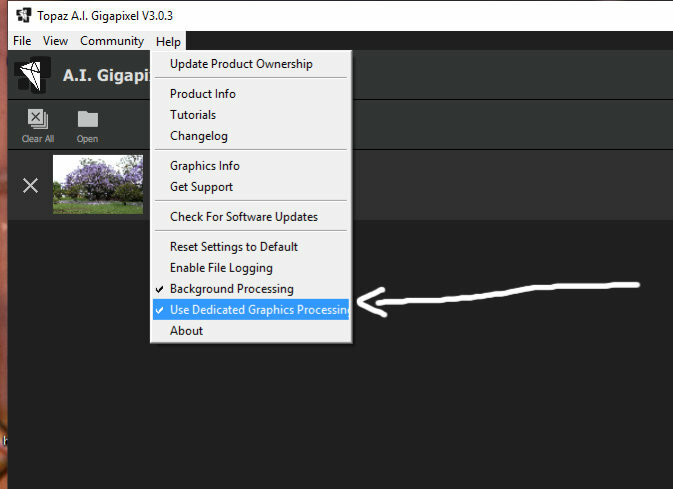 If you were having to use CPU processing in Gigapixel that would suggest they don’t. I don’t think I’m being too harsh on Topaz. Rolling out a crippling major release without testing it properly is using your customer base as Beta testers. The product is expensive and as a customer I expect a level of quality and respect. This update wasted more than two hours of my time. The only thing Topaz accomplished here is making me not trust them when an update comes out which is too high a price for any company to bear. I agree too many companies roll out updates without properly testing them, and Topaz is now one of them. Losing trust is very hard to regain in the software marketplace. Yes, I have raised a support request. I was able to roll back to 2.1.1 and using the the same jpeg that was rejected in 3.0.3 as being the “Wrong Input Image” I was able to convert it. The issue here is 3.0.3 is not accepting simple jpegs for conversion. This shows to me Topaz has not tested their update properly. Accepting jpegs is what the software is designed to do! All Topaz products have been working well since they were purchased. So I’d see it on your hardware problem. I also tested jpeg - no problems. Probably a small RAM. I found the Use GPU switch … it is a lot faster than I originally posted! My main issue is that quality has dropped since the last version. I have run through a dozen images, comparing the results to those provided by the previous version. The new version outputs images that are noisy and over-sharpened in every single instance. I would say that, in most respects, they are objectively worse every time now. I appreciate you testing this out. Looks like staying with 2.1.1 is the way to go for now. Uncheck Help → Use Dedicated Graphics Processing to use CPU processing. Our data tells us that 95% of users use the GPU processing mode, so it is now default. Why don’t the geniuses at Topaz do something simple like present the people who pay good money for plugins, a product that works for a change. Any more money to Topaz until they fix their business affairs regarding their products is a none starter. Thanks for the feedback, Randy! We actually have many happy customers, and our products do work quite well. It’s unfortunate you don’t feel the same way as most folks, but that’s bound to happen in a consumer-facing product like this. Can’t make everyone happy, and some people simply refuse to take our help when we offer it. People we can’t help, we refund. I hope your day goes well! 100% of the cases reported to me of this error have turned out to be caused by images with no valid color profile assigned to the image. These images cannot be saved with a color profile using our processing because we require a valid profile to be attached to the input for conversion. The processing engine requires that profile. No profile will cause this error every single time. We’ve fixed a number of faults in this update that allowed invalid images to process, which gave bad results. If you don’t believe me, send me the image, I’ll save it with a valid color profile, process it in A.I. Gigapixel, and send it back to you with a bunch of screenshots showing that what I say is true. I’ve done it for at least 10 people in the last two days, and I’m happy to do it with one of your images as well. I have actually requested this in a message I sent you through the support channel. Anyway, that missing CPU processing support in 3.0.3 is a bigger issue, if you ask me. As noted earlier in my reply, just uncheck Use Dedicated Graphics Processing and you’ll be on CPU mode. The feature now remembers your choice, so you don’t have to keep your eye on that toggle to avoid issues. We thought it was a considerate change to make, since our data shows people don’t change that option once they set it. Give us back the option! The processing has not changed in any manner whatsoever. This was an interface update, only. The models are exactly the same as they were in the previous version. Can you provide some comparisons that show this apparent change in output? Thanks! Help us help you. Give us the image that fails. Tell us what happens. Give us time to fix it. We do fix our bugs. There were easily half a dozen problems in A.I. Gigapixel v2 that prevented many customers from using the product, that were resolved with this update. I would also like to comment about beta testing. We did beta test this product, which is why the update is v3.0.3. We released three versions prior to this to our beta testers, 3.0.0b, 3.0.1b, 3.0.2b. Good morning, Joe. I just went through the process of installing v3.0.3 over v2.1.1, and my problem still exists. The installation process appeared to complete normally, after the Wizard deletes the previous version. However, when I go to run v3.0.3, nothing happens. Any suggestions? BTW, running El Capitan 10.11.6 on mid-2010 Mac Pro, with 128 GB RAM, and Nvidia Quadro K5000 4096MB graphics card. We’ve seen some reports of issues with 10.11, but haven’t confirmed that the OS is the problem just yet. Is anyone else with 10.11 in this thread able to launch A.I. Gigapixel 3? I’d like to note that we normally test on the three latest versions of any OS, as that’s all we’re really able to maintain here as a small company. We don’t have the resources to support dated operating systems, so we try to keep the support limited to current OSes. That’s just the reality of our small company, but we do the best we can within reason. I have exactly the same problem. I am on El Capitan, I updated 2.1.1 to 3.0.3 and now the software does not start anymore. I think that it should work, if El Capitan is supported; on the contrary, if El Capitan is no more supported, a clear warning should have been displayed during the updating process. I will wait for some days for news, then I will be forced to reinstall 2.1.1. It’s a pity.